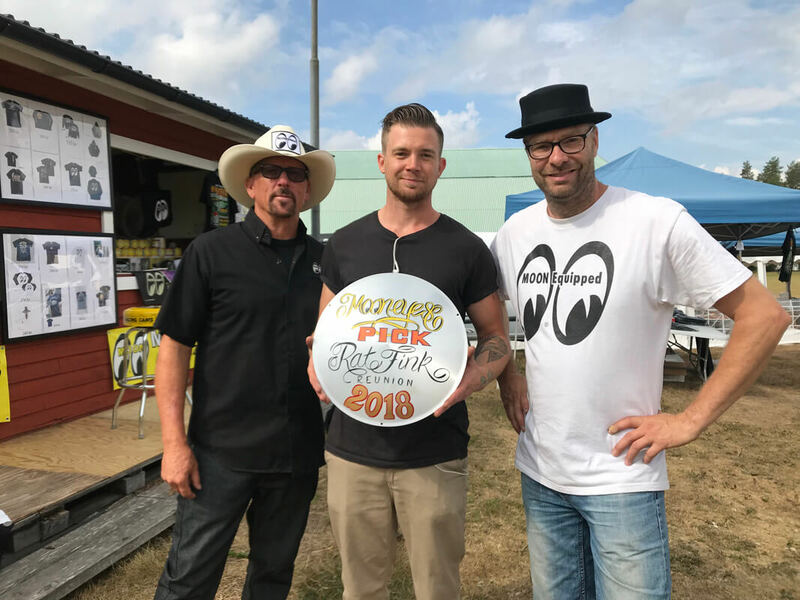 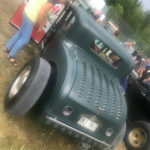 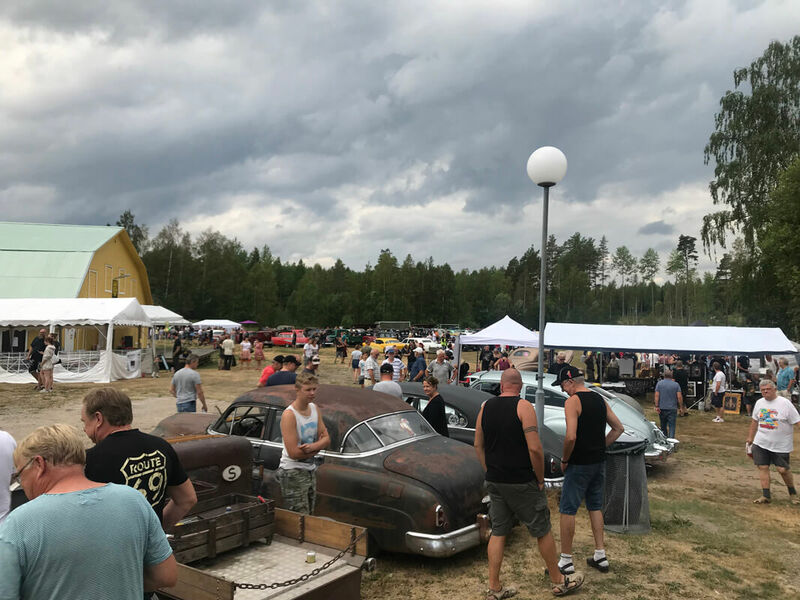 This was the 14th Annual Rat Fink Reunion put on by Mooneyes Sweden, this was the first one I have attended. 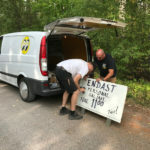 This is a one day show but two day’s of events surrounding. 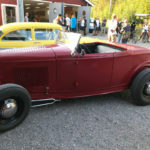 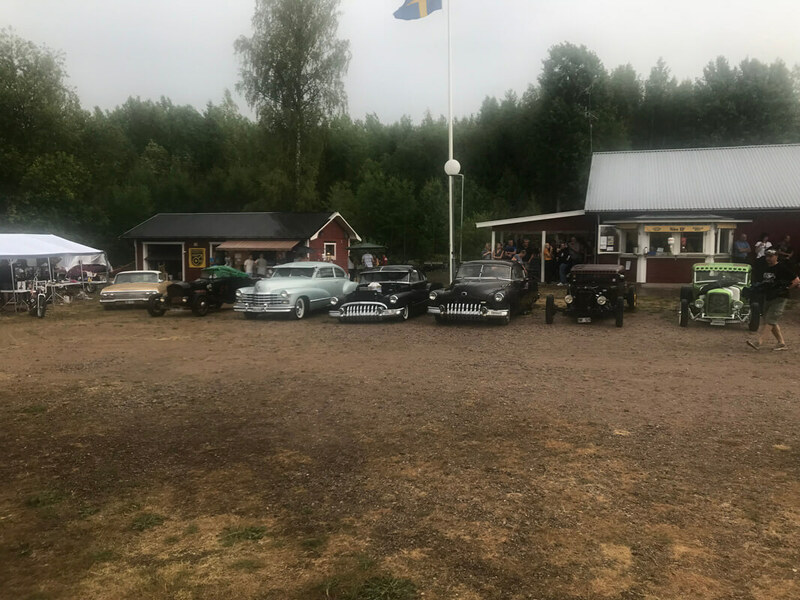 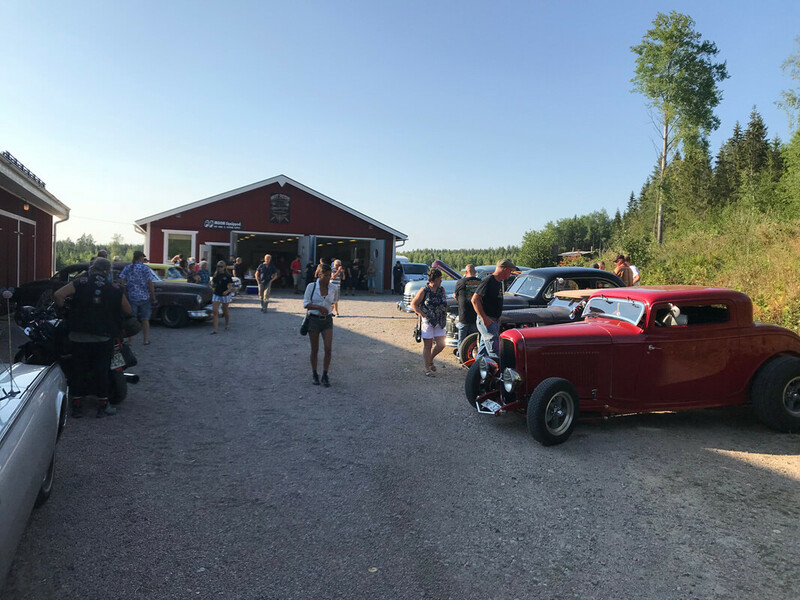 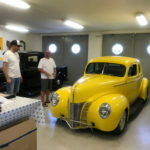 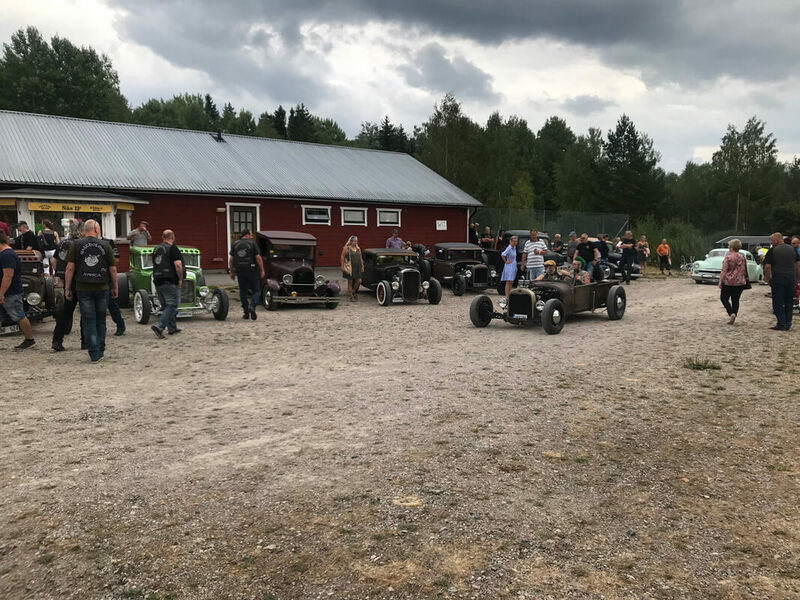 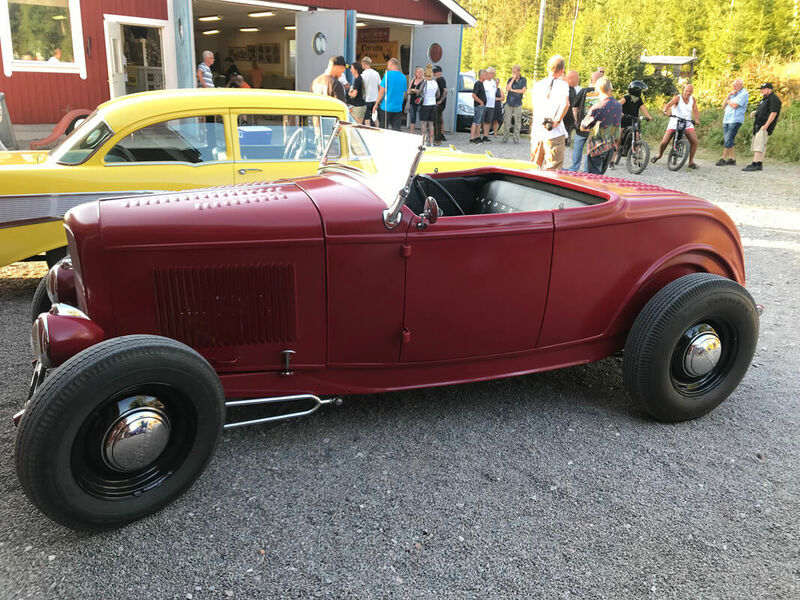 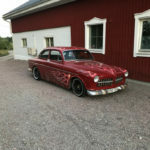 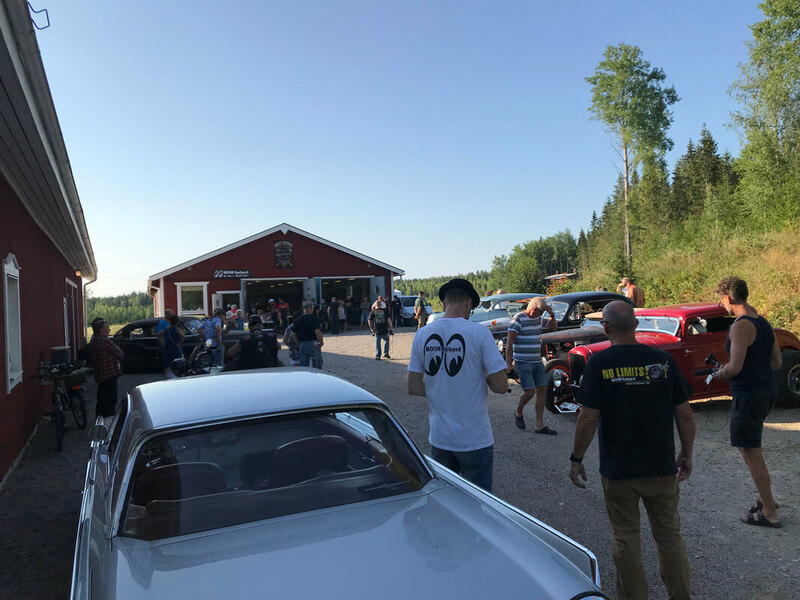 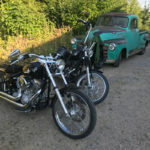 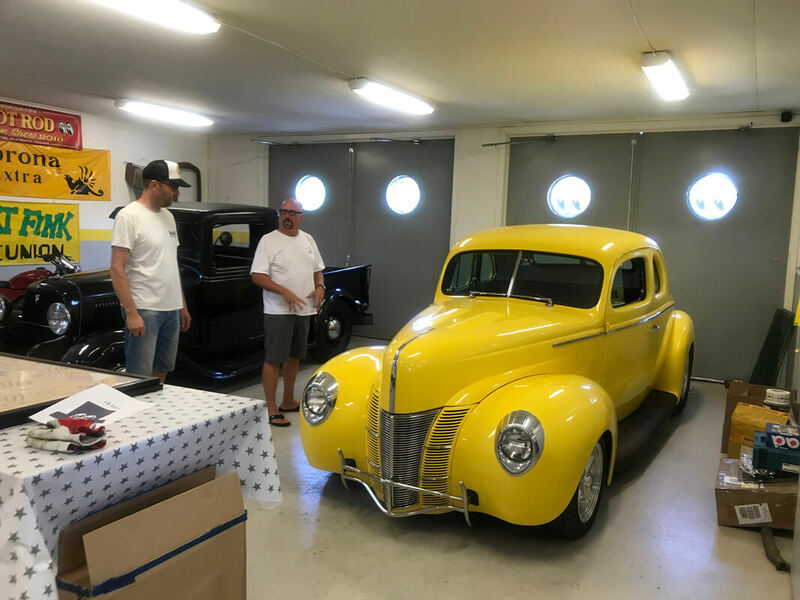 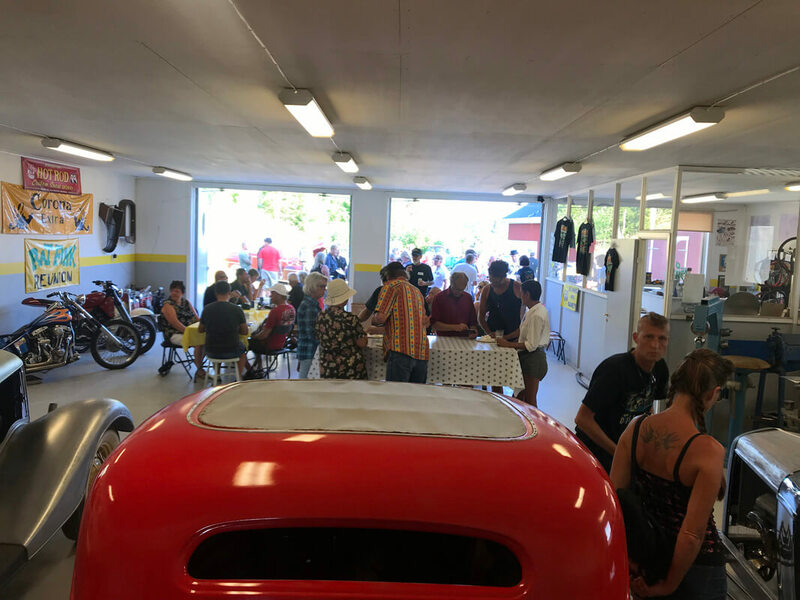 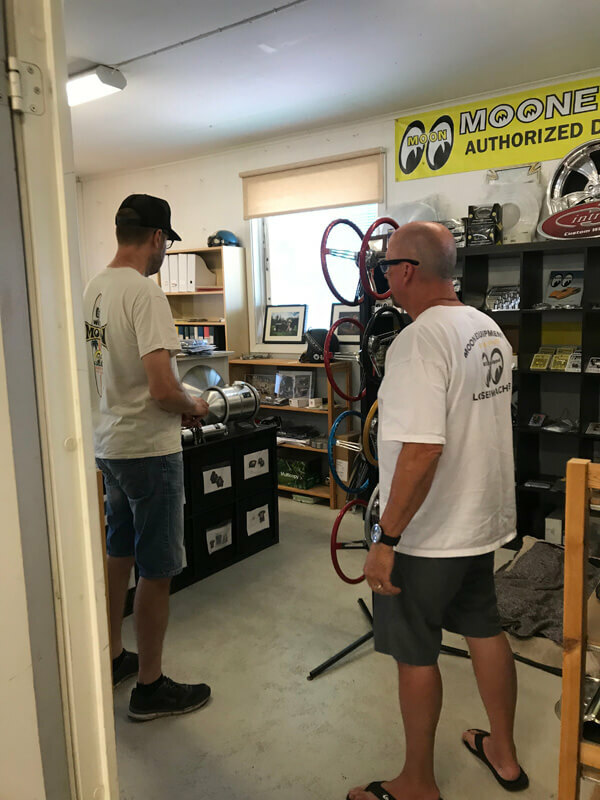 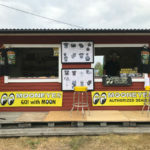 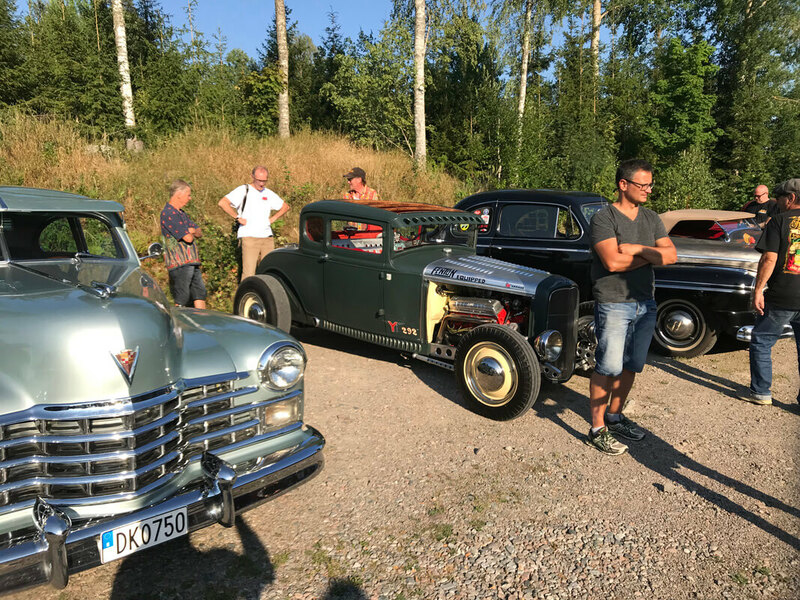 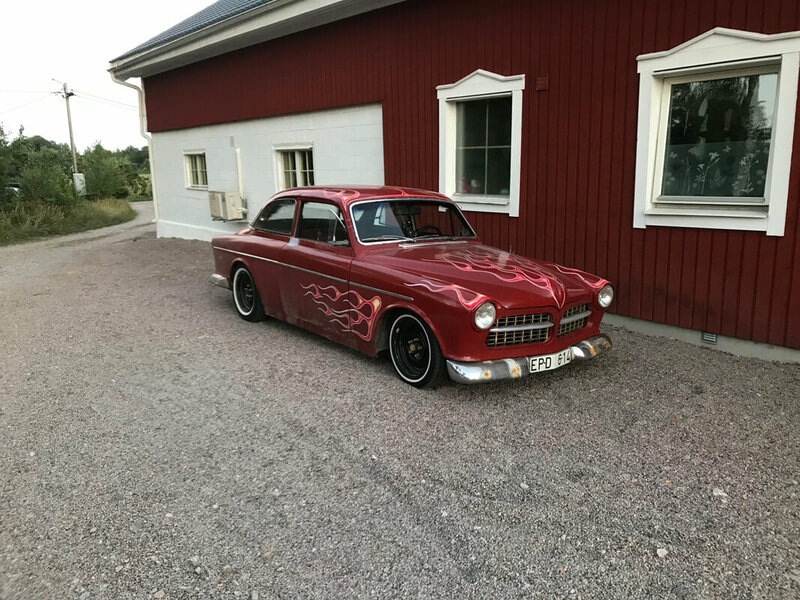 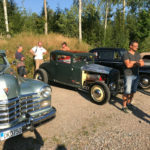 Starts with an Open House on Friday night at Mooneyes Sweden that includes a barbeque for 100 plus attendee’s. 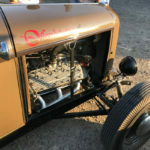 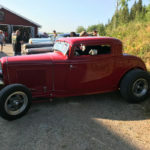 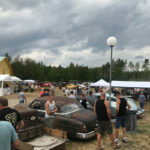 Saturday is the show put on at a nearby soccer Facility, this includes about 400 cars, close to a dozen vendors, several pinstripe artists, a Pin Up contest, food and awards. 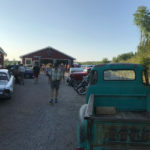 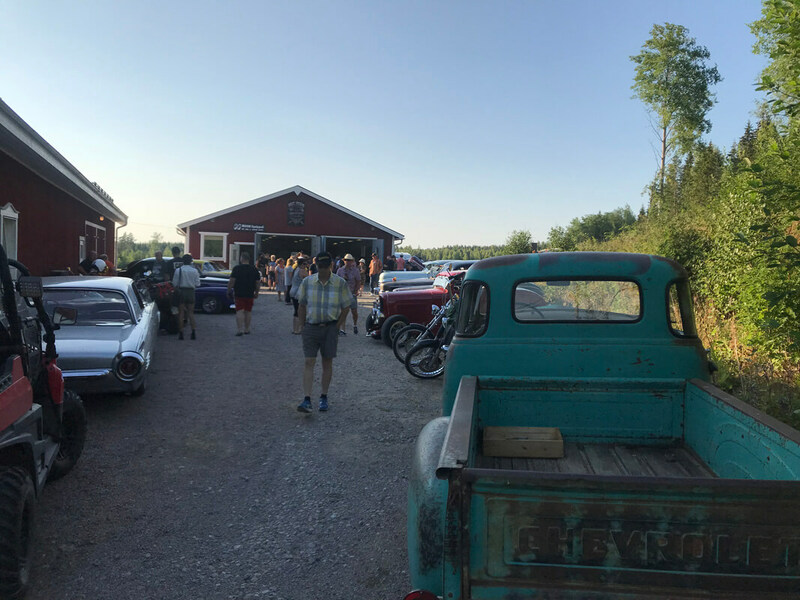 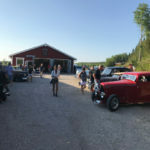 Saturday night is a Rockabilly style dance party put on in a huge barn that was purpose built to host concerts and events, this party included a couple bands, food and plenty of spirits. 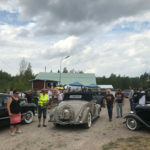 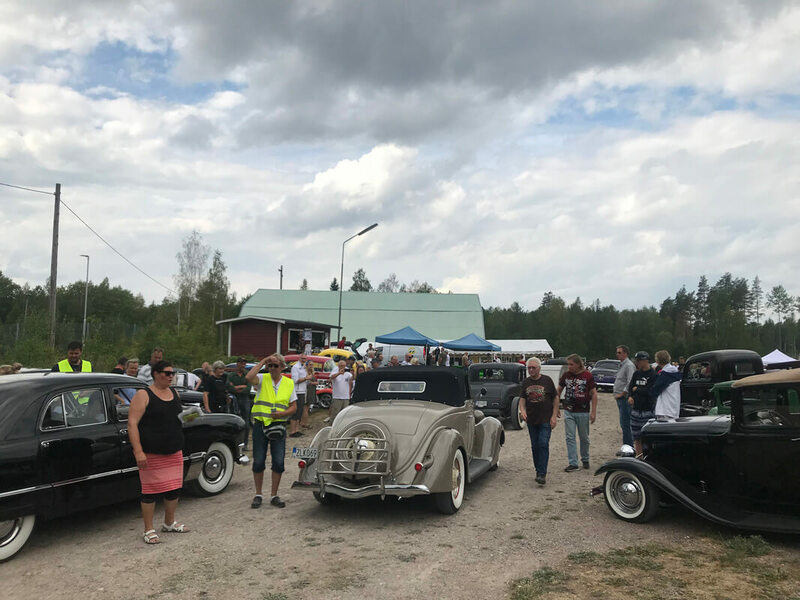 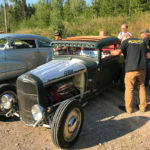 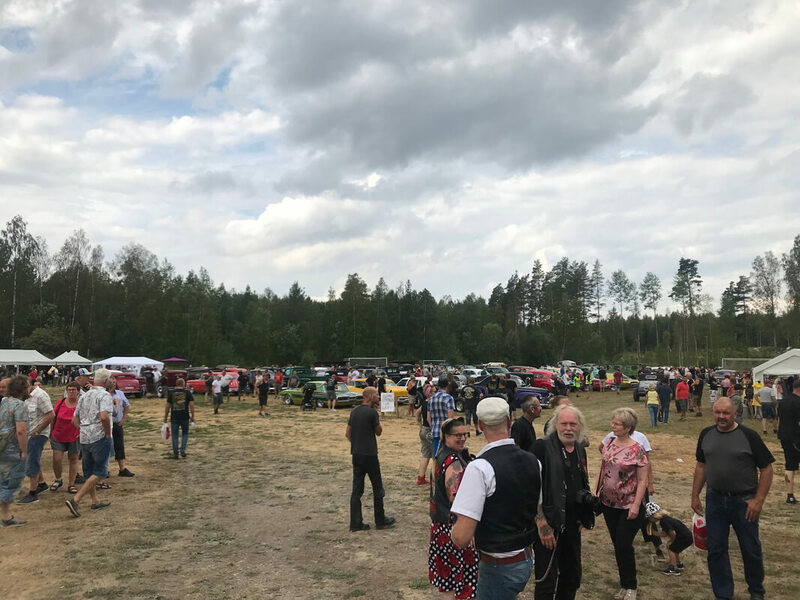 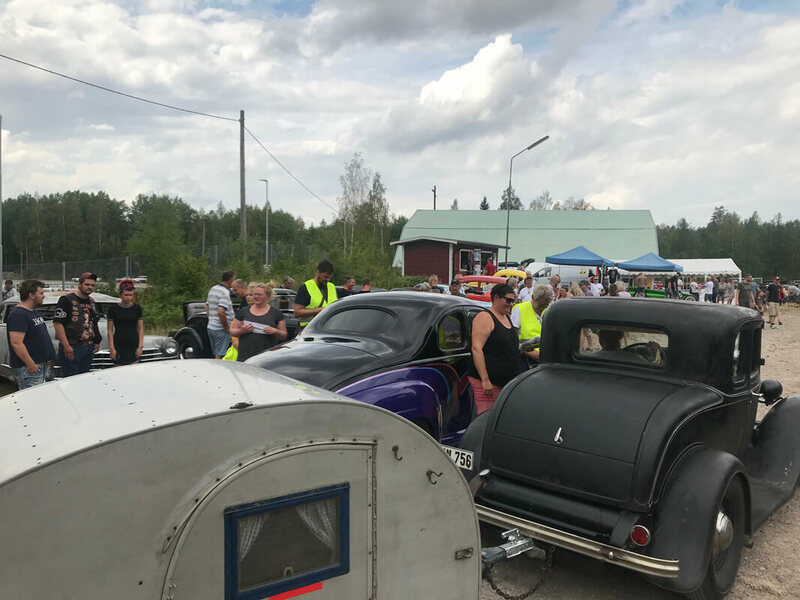 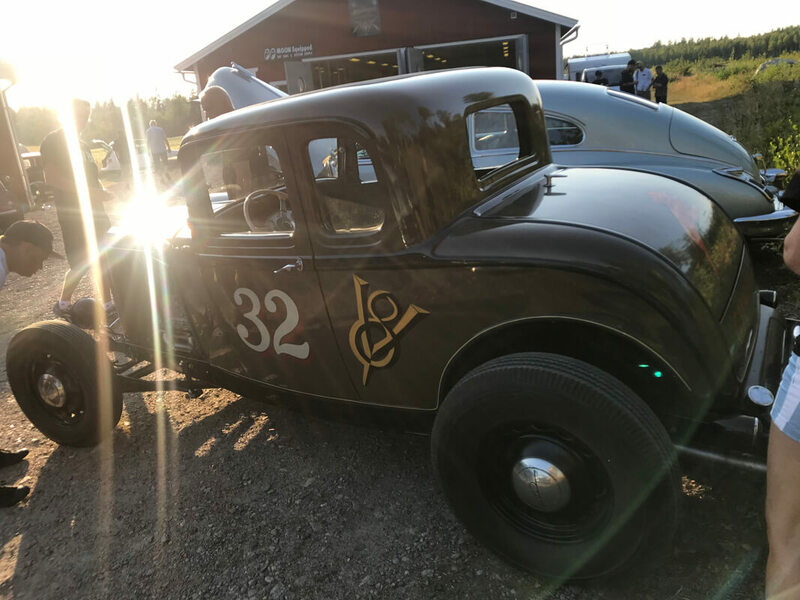 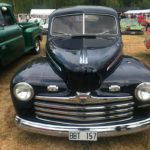 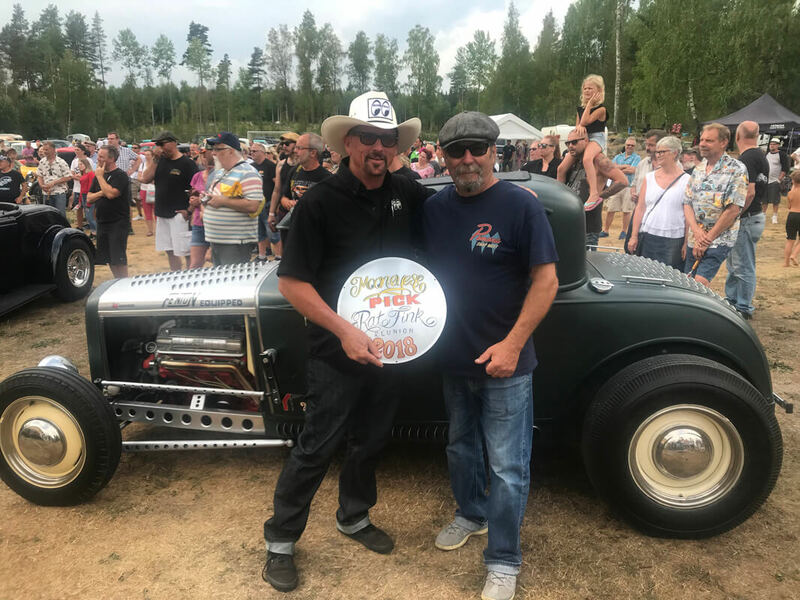 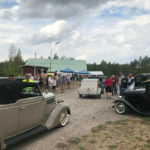 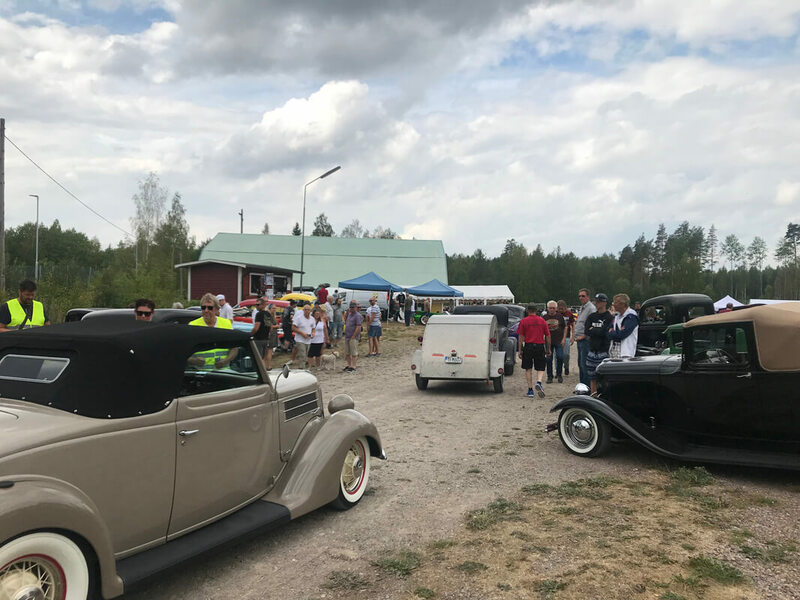 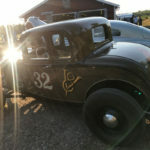 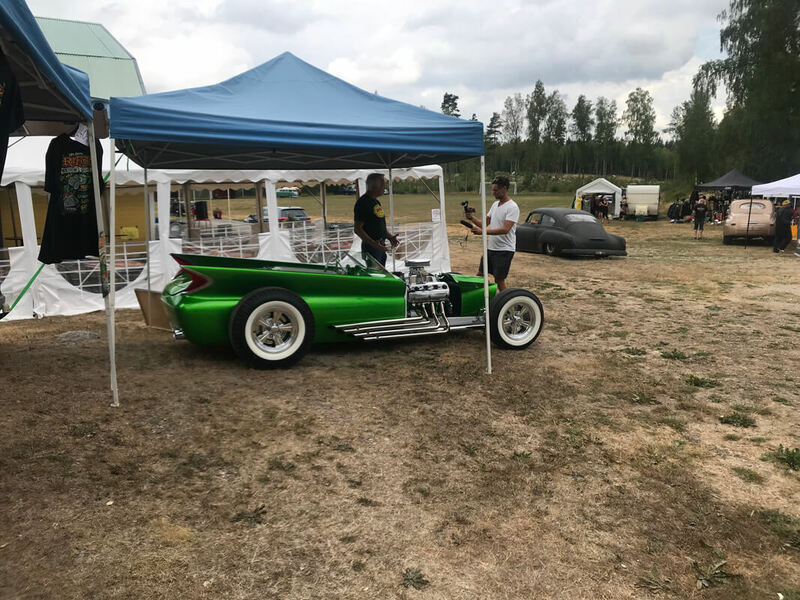 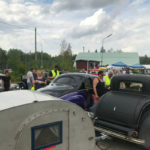 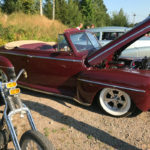 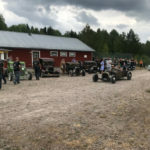 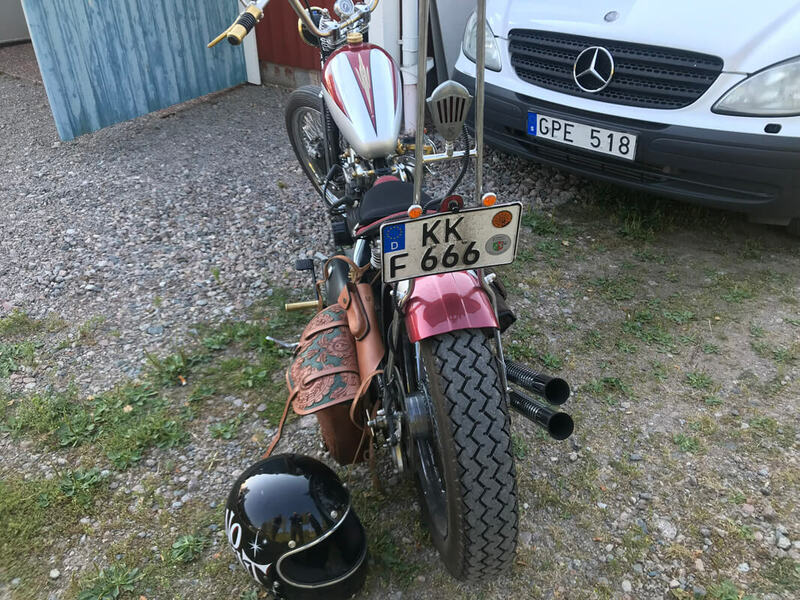 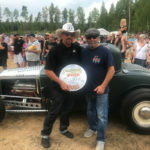 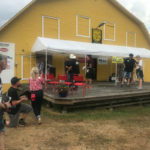 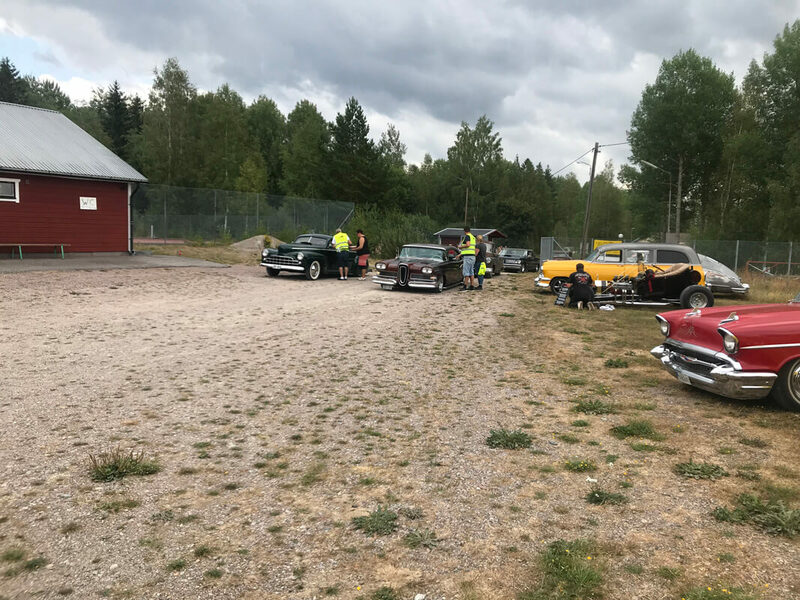 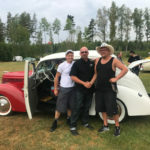 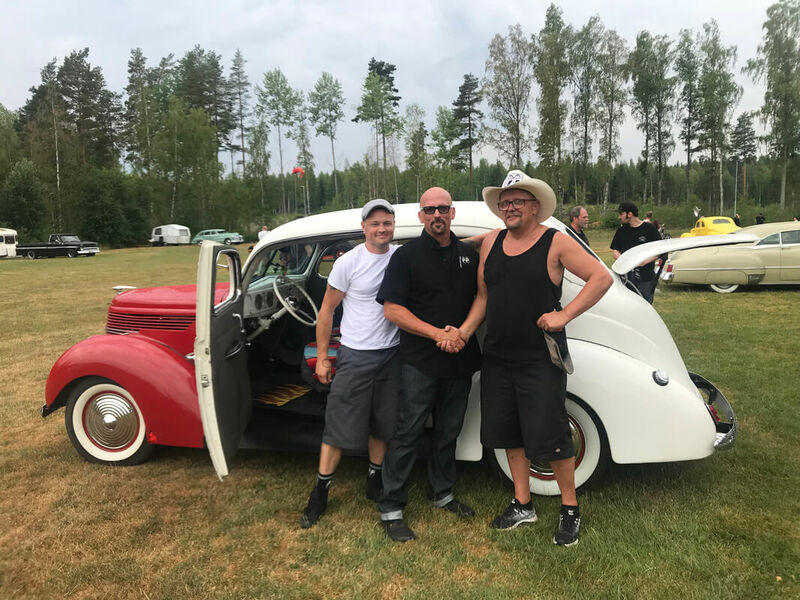 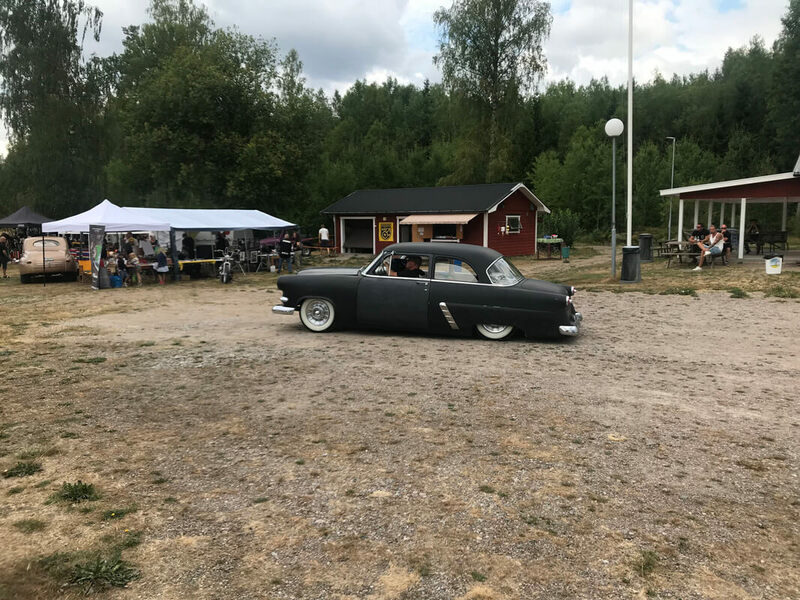 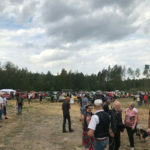 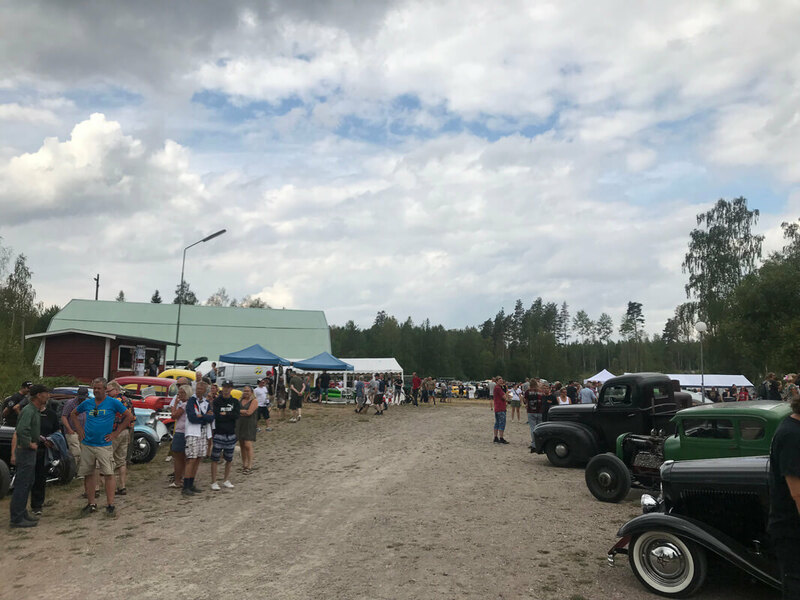 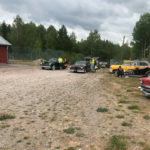 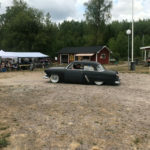 I was lucky enough to attend the Rat Fink Reunion in Sweden this year with my wife Leslie. 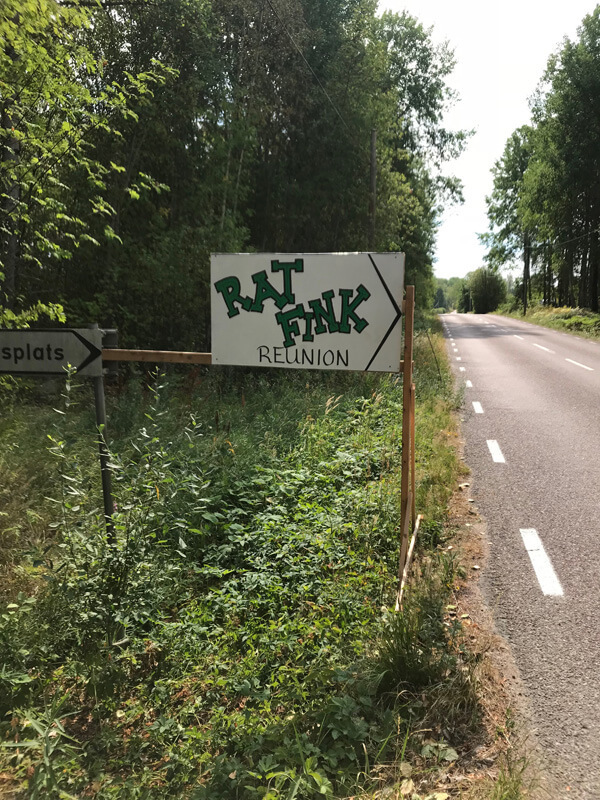 We arrived in Sweden Thursday after the flight in from L.A. which I pretty much slept through. 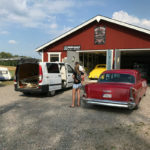 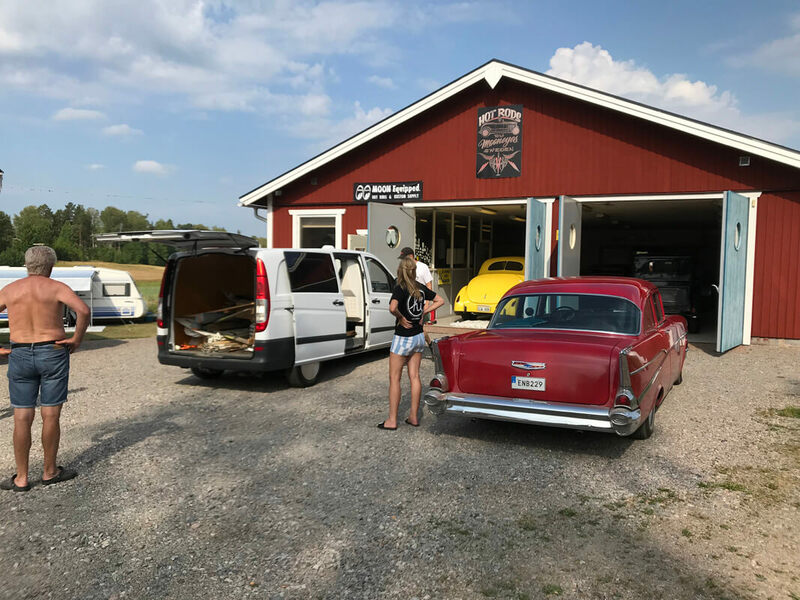 Hank picked us up at the airport and we drove about two hours to his shop. 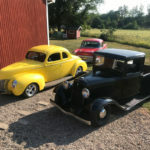 On the same property is Hank’s home where we met Hanks wife Alke and his kids. 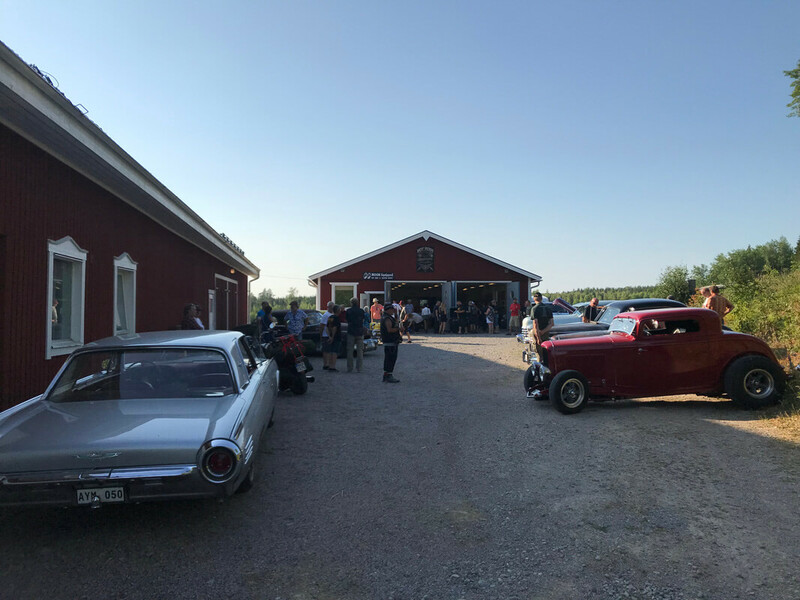 Alke and Hank fired up the barbeque and prepared us an awesome dinner. 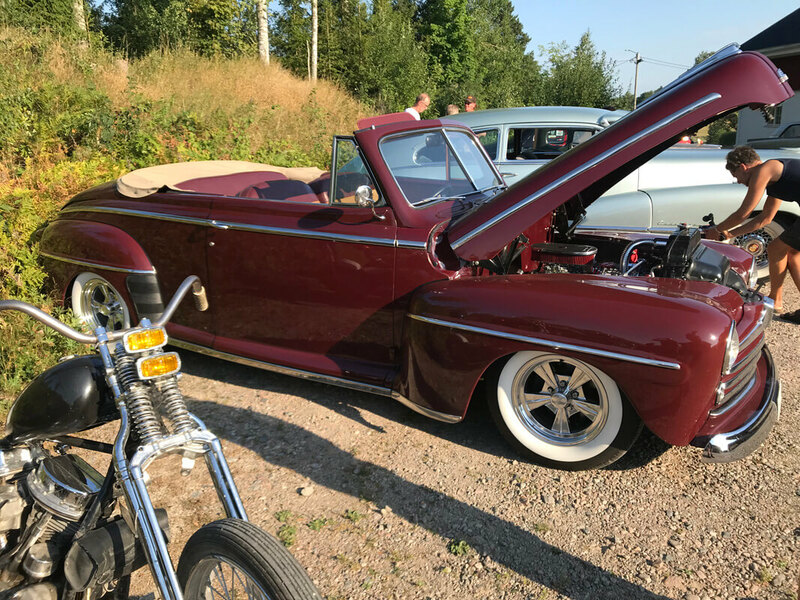 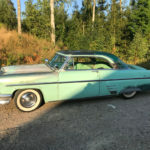 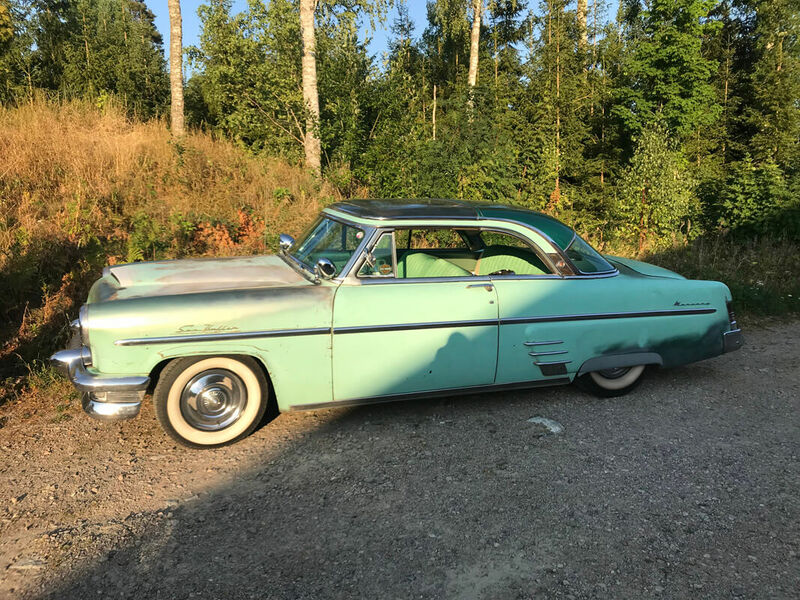 After dinner Hank gave us the keys to his sweet 57′ Chevy and we headed off to our digs, a BnB on the lake about two miles from Hanks place. 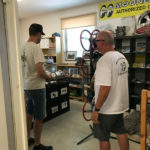 Friday was set up day, after we slept in a little long we headed over to meet Hank. 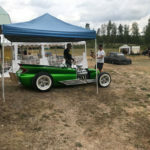 We all went down to the show grounds and got things set up for the show. 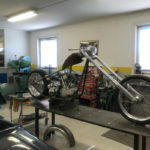 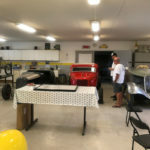 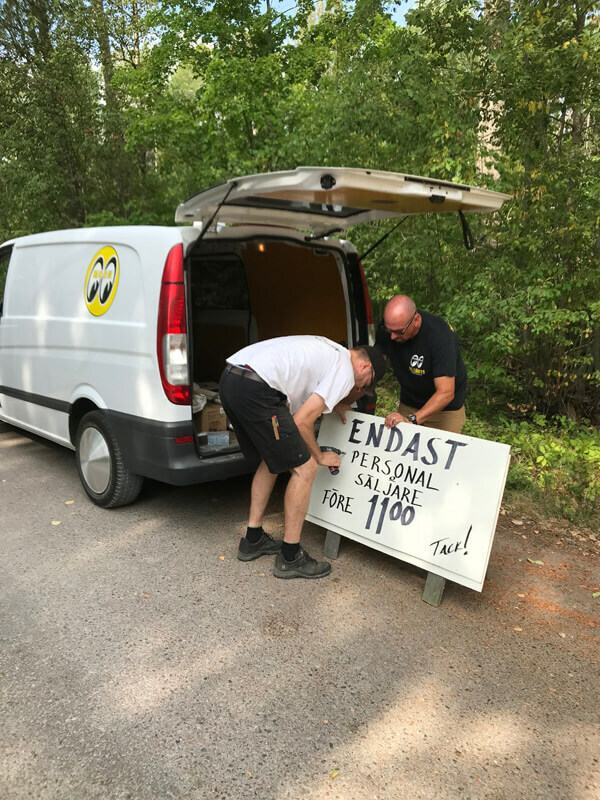 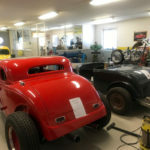 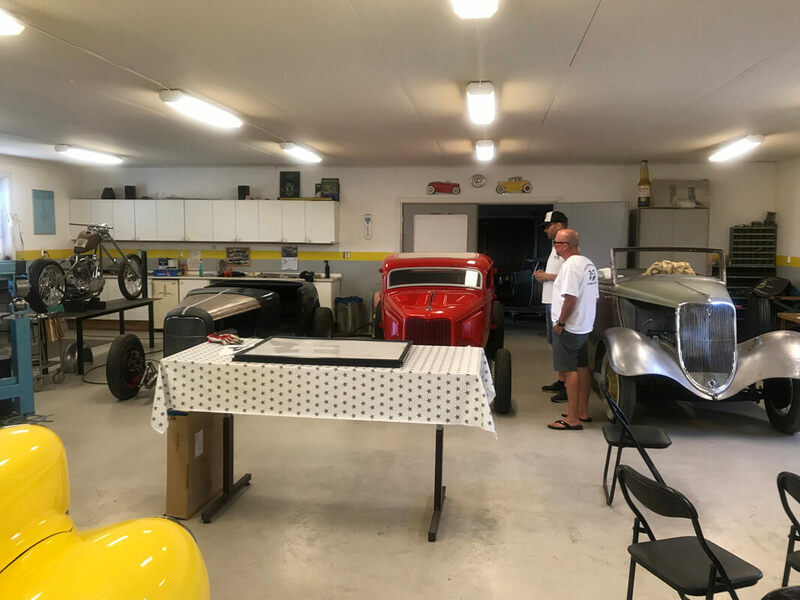 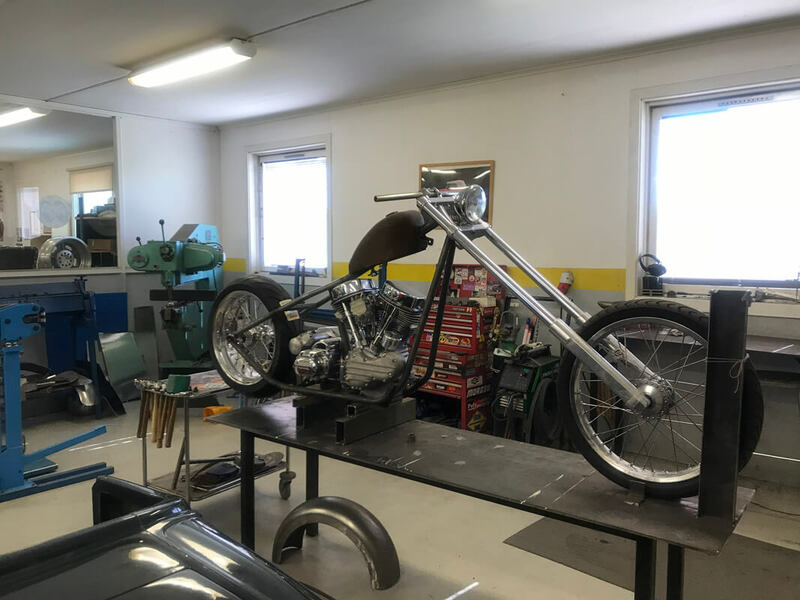 Then it was back to the shop to get ready for the Open house. 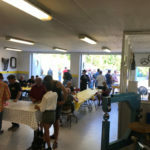 The Open House was well attended, there was 120 bbq Hamburgers given out in a little over an hour. 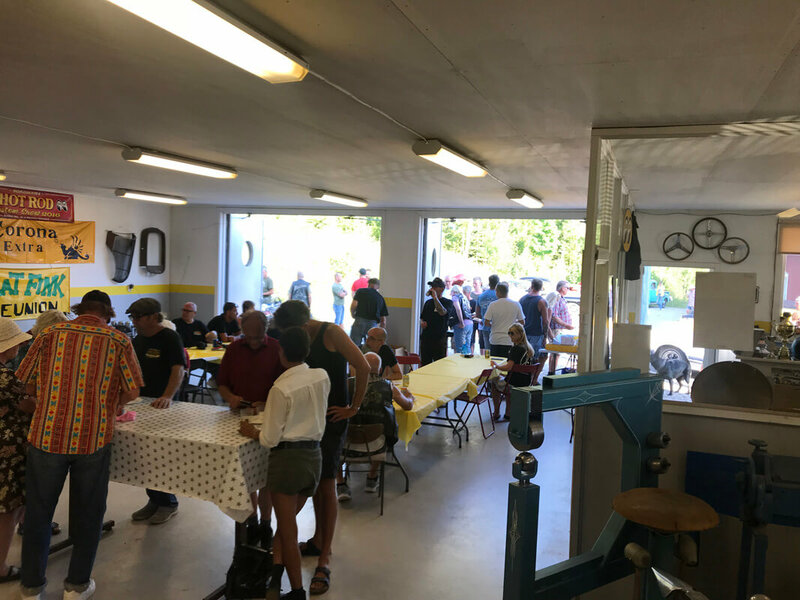 People would come and go to the open house over several hours, there were a couple dozen bikes as well as several dozen cars. 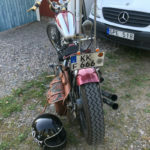 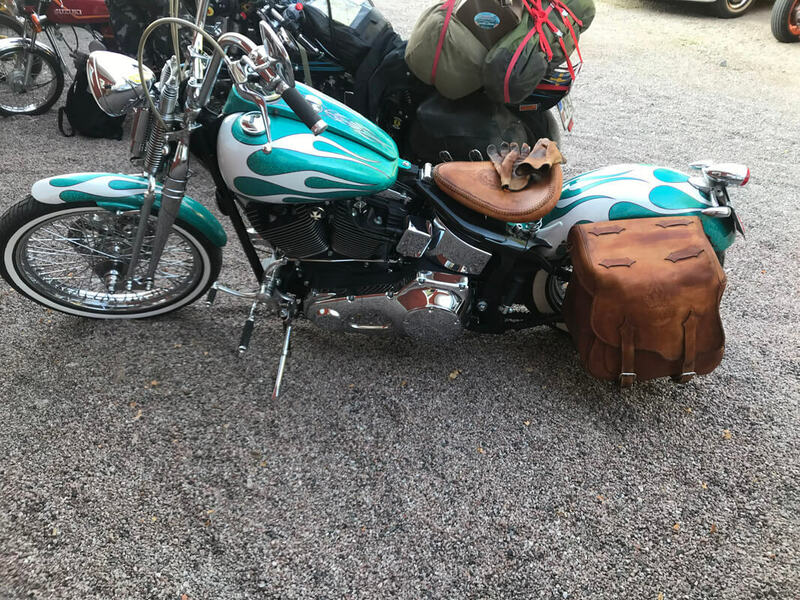 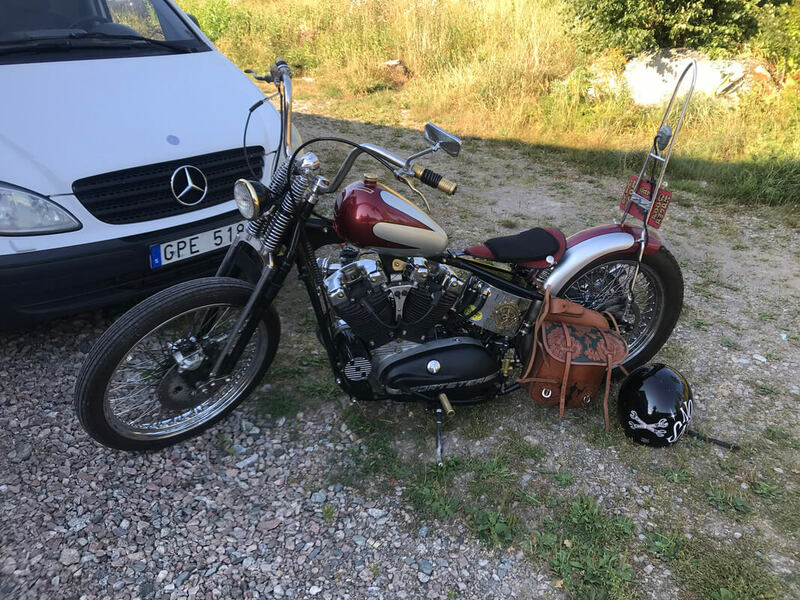 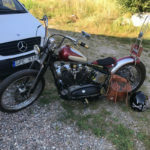 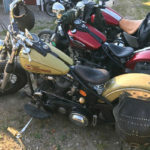 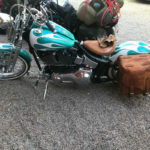 I got to meet a lot of cool people including Lutz who rode his Harley up from Germany. 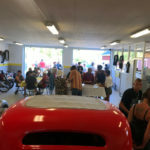 Open House lasted several hours and ended a little past 10PM (I’m not used to the sun setting this late). 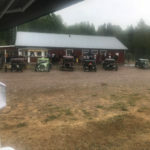 Saturday woke up to cloudy skies, kind of a relief as the last couple days it’s been hot. 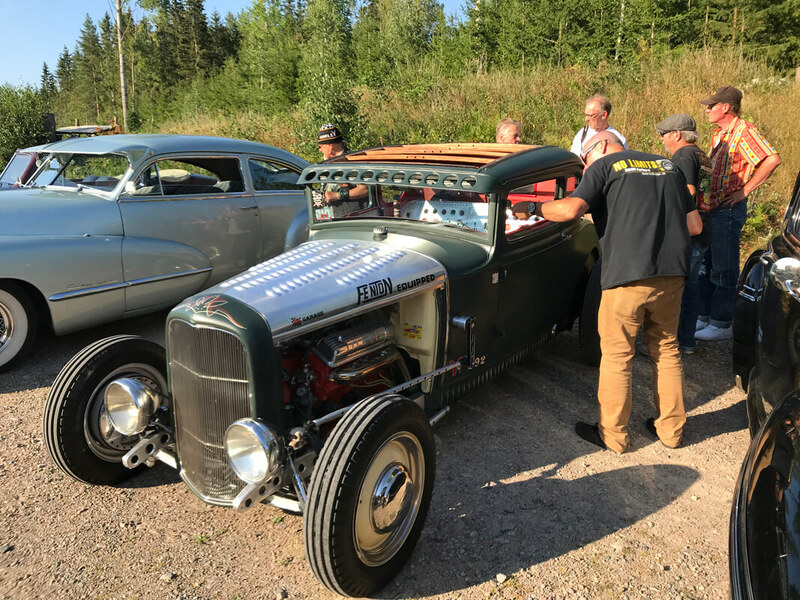 We headed over to the show early and got ready for the day. 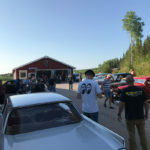 Gates opened at 11 and there was a line of cars ready to come in. 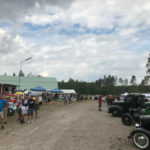 By noon there were two soccer fields filled with show cars and spectator parking was full. 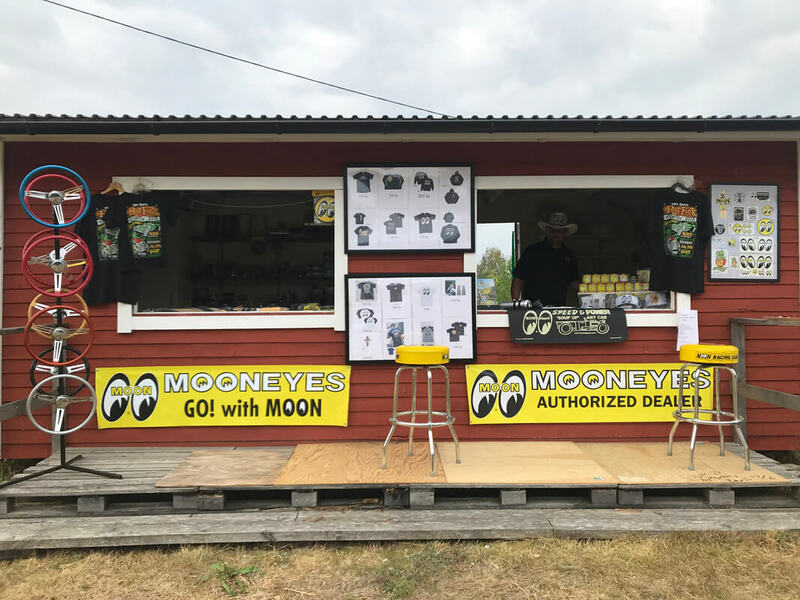 Leslie and I took our place helping in the Mooneyes merchandise booth with Alke and Hanks son Devin. 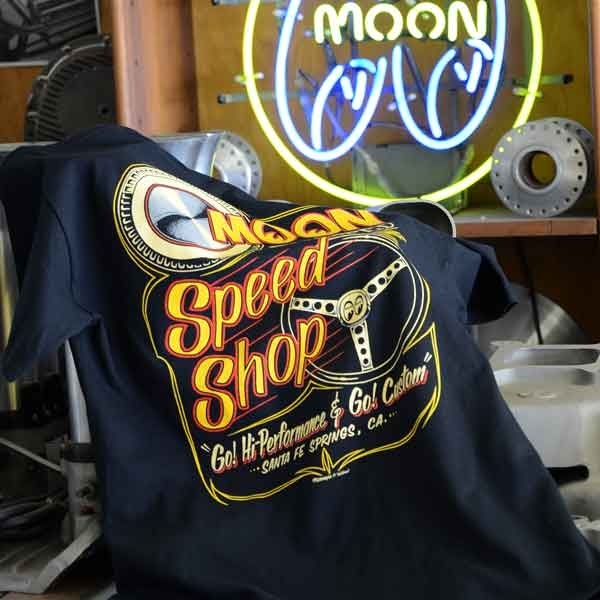 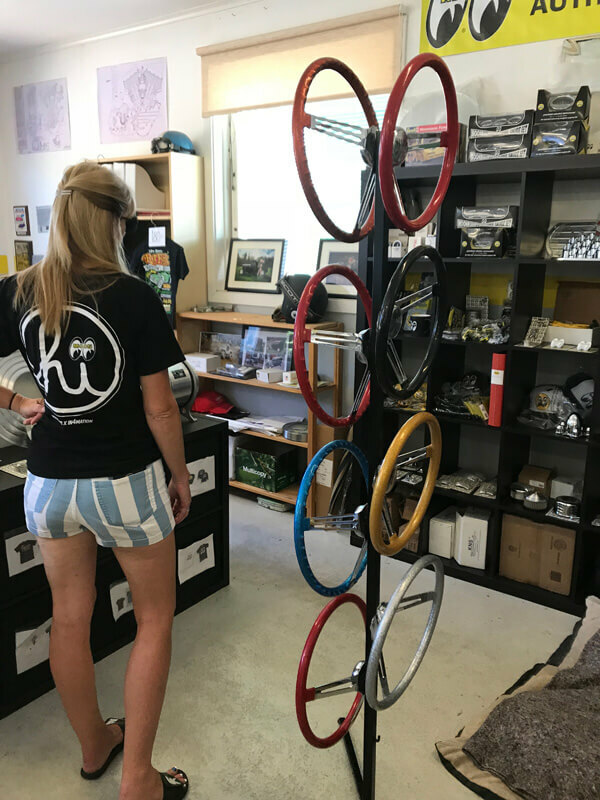 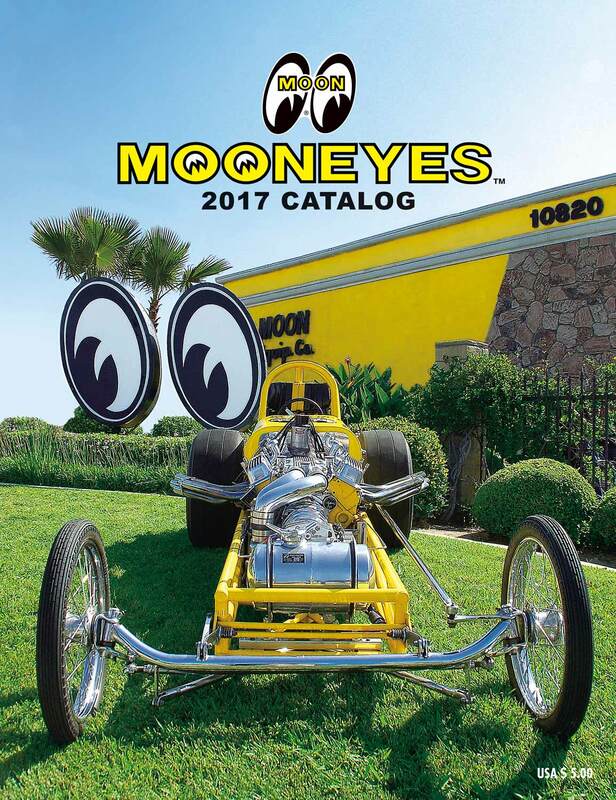 Talked to a lot of people who were happy to see that Mooneyes sent us from California, lots of cool stories. 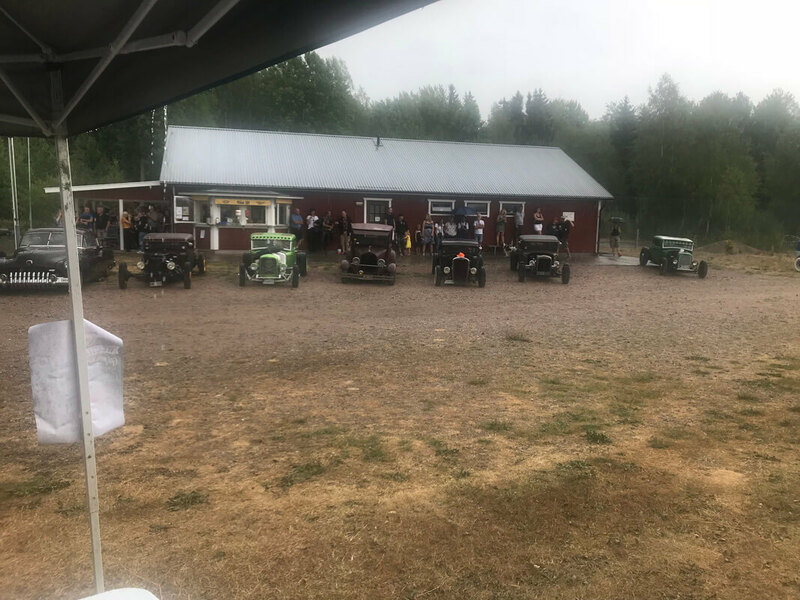 Skies opened up with a heavy downpour just a couple hours into the show but it only lasted for about twenty minutes and everybody just seemed to take cover and ride it out, show goes on. 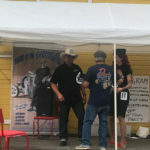 In the afternoon we gave awards. 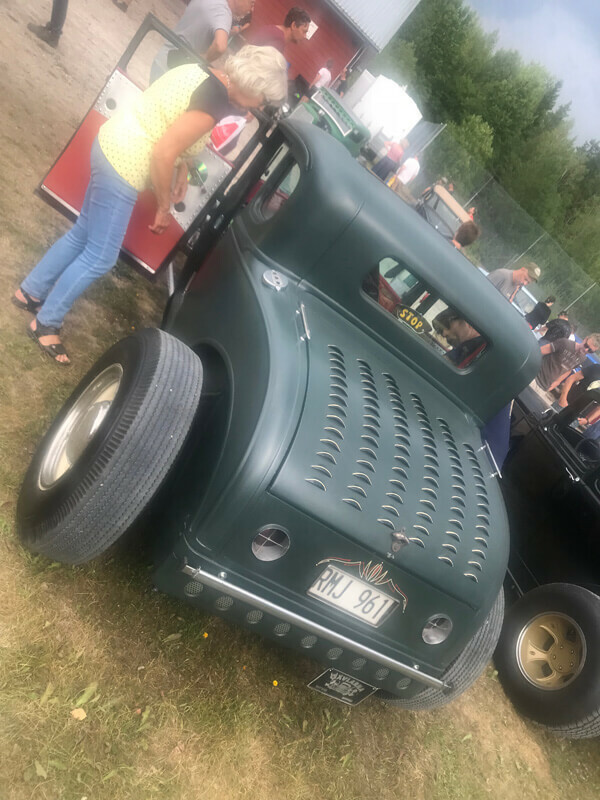 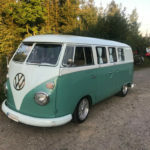 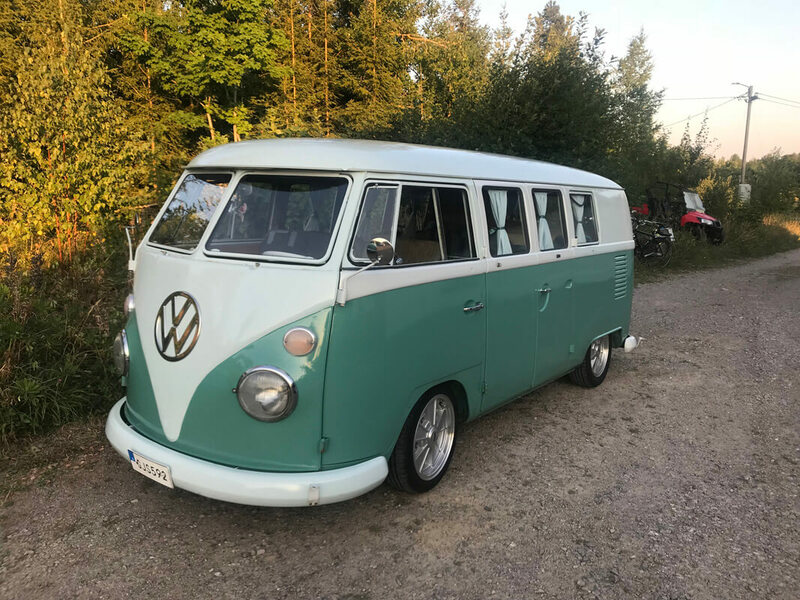 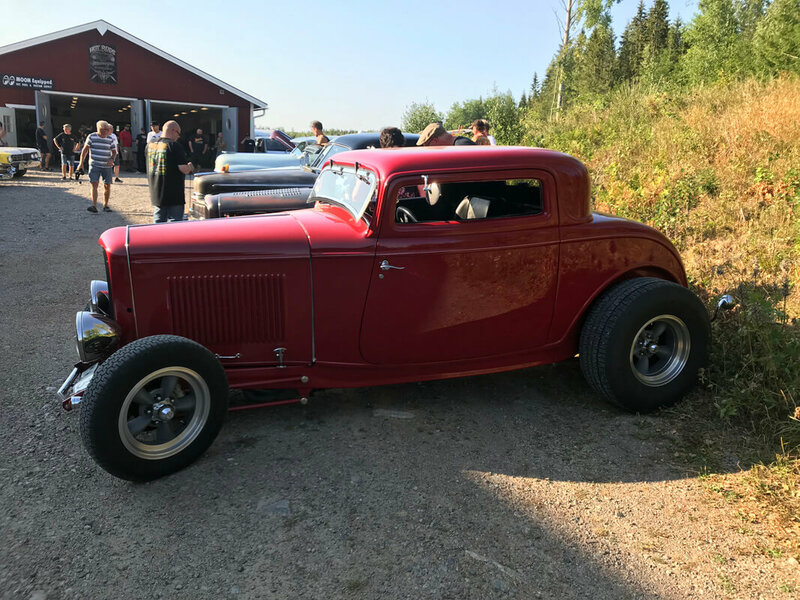 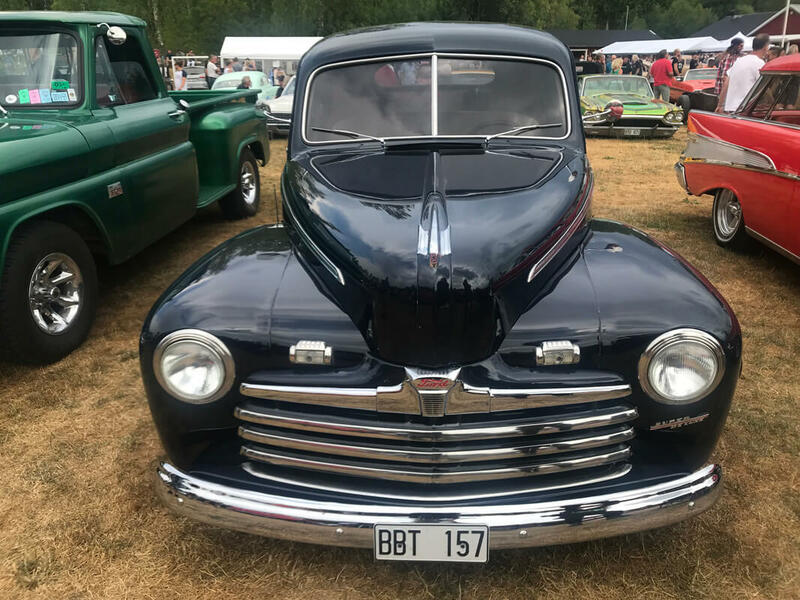 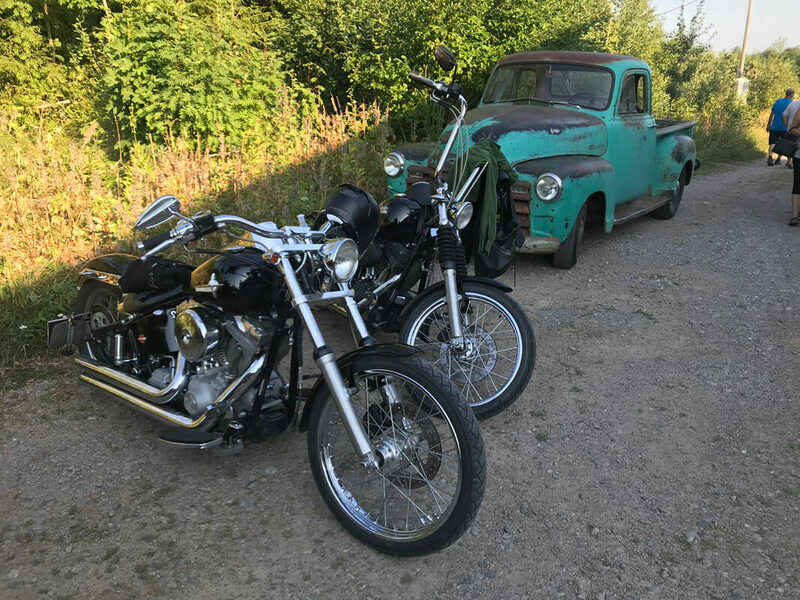 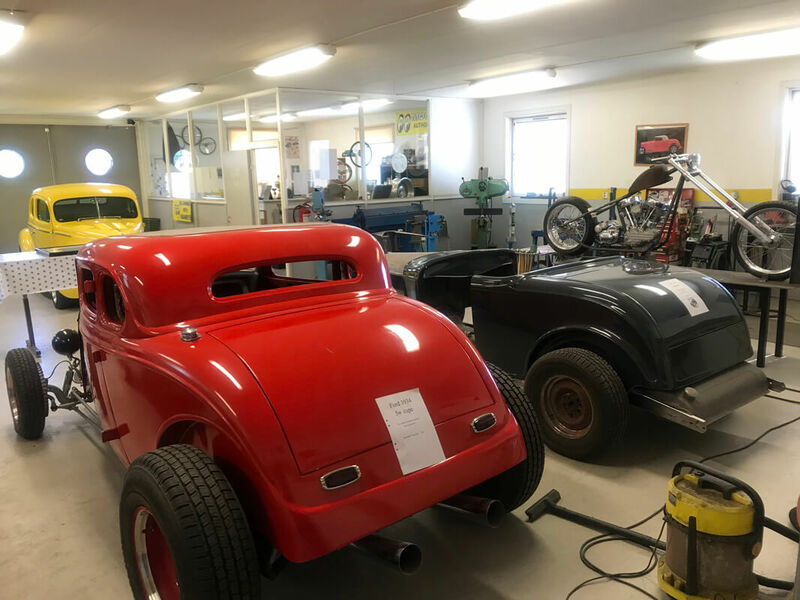 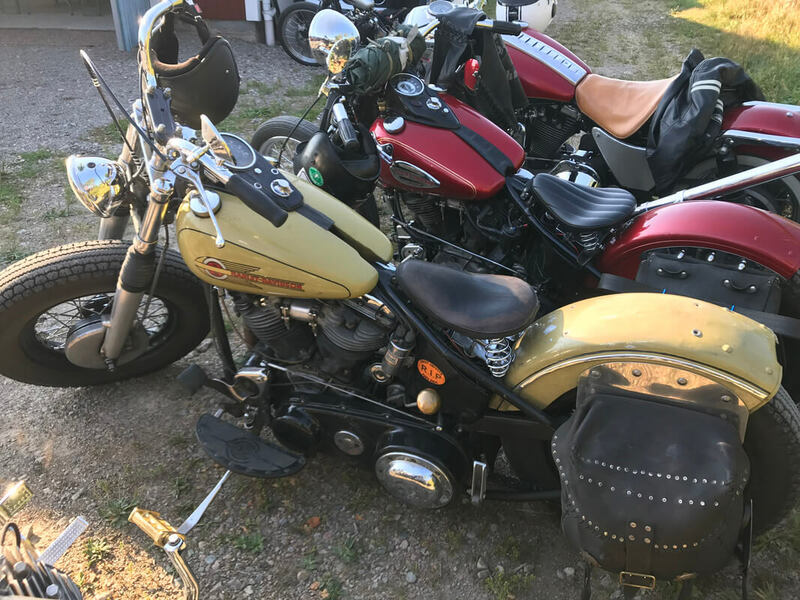 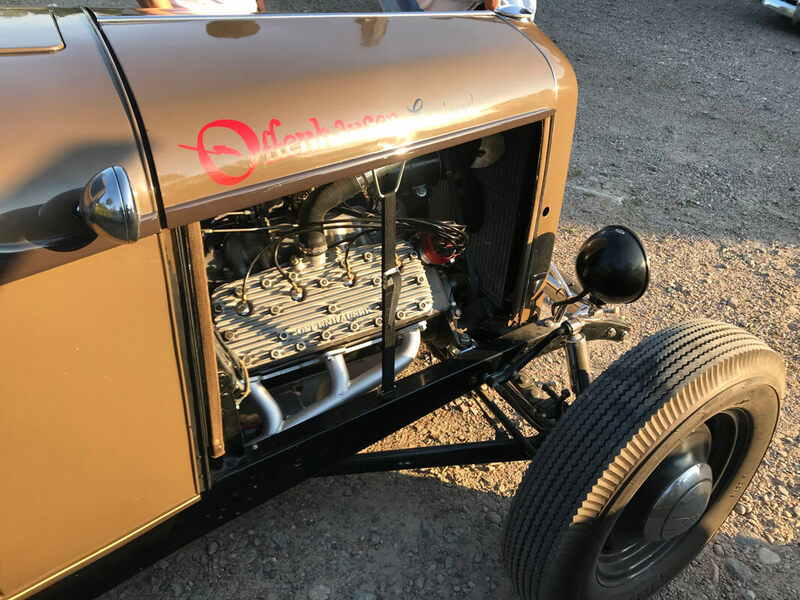 I choose a traditional 5-window, y-block powered 32′ that had a lot of custom metal work inside done by the owner, He told me to just call him John. 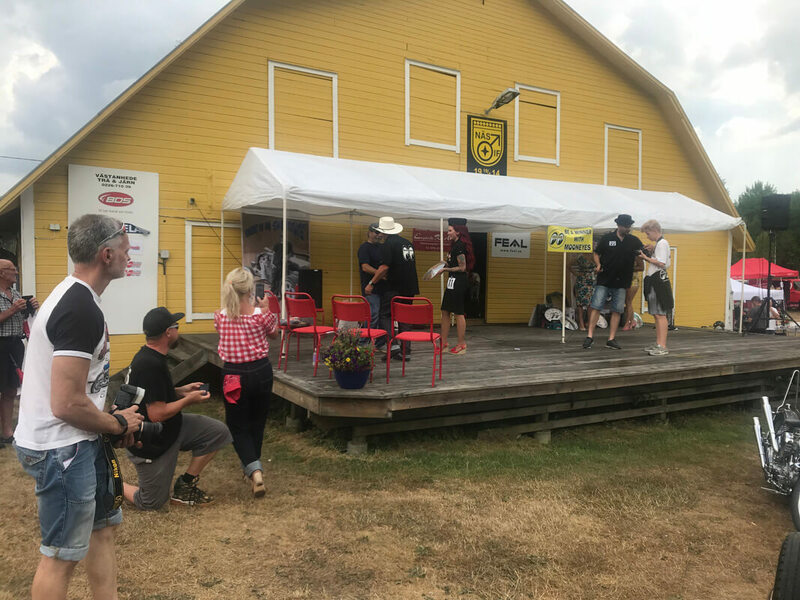 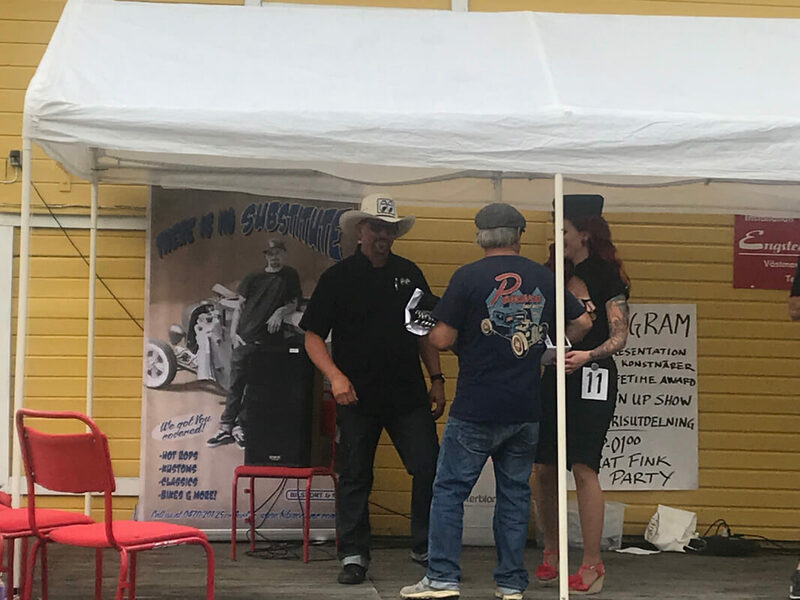 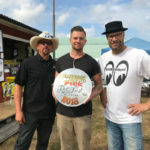 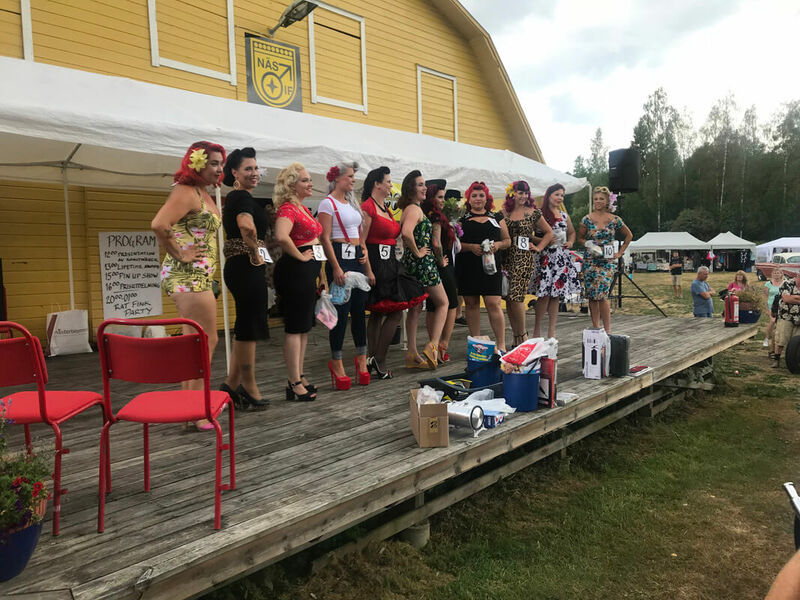 I then got to help judge the Pin-Up contest in which the winner was getting a trip to The 2018 Mooneyes USA Christmas Party to participate in our Pin-up contest. 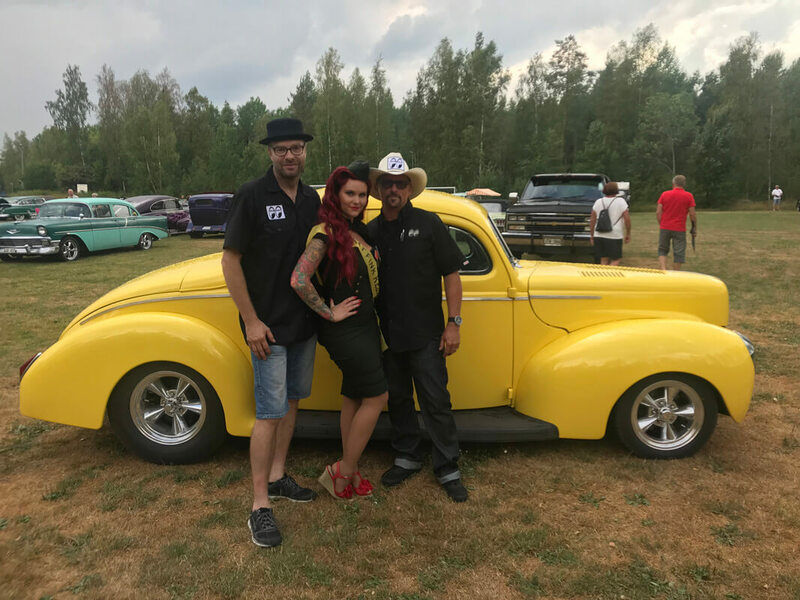 The winner was Miss Silver Freak (Johanna Bergerin), she is really looking forward to coming to California. 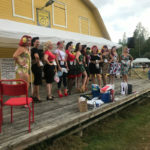 The show lasted until about 4 o’clock, everybody went back home or to the local campground to get ready for the evenings festivities. 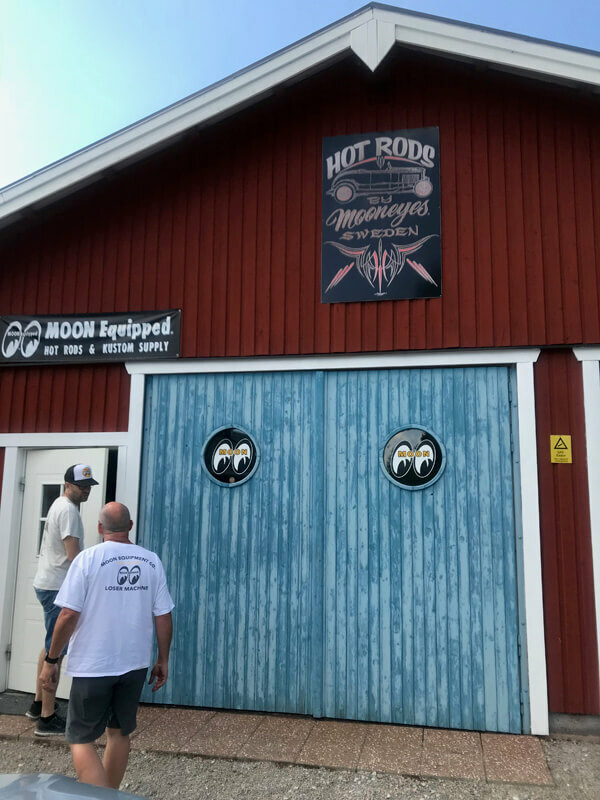 We took a break for a couple hours, went to see the Giant Red Wooden Horse in Aveesta and had some dinner then it was back to the showgrounds. 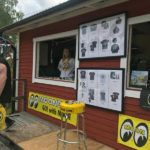 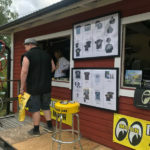 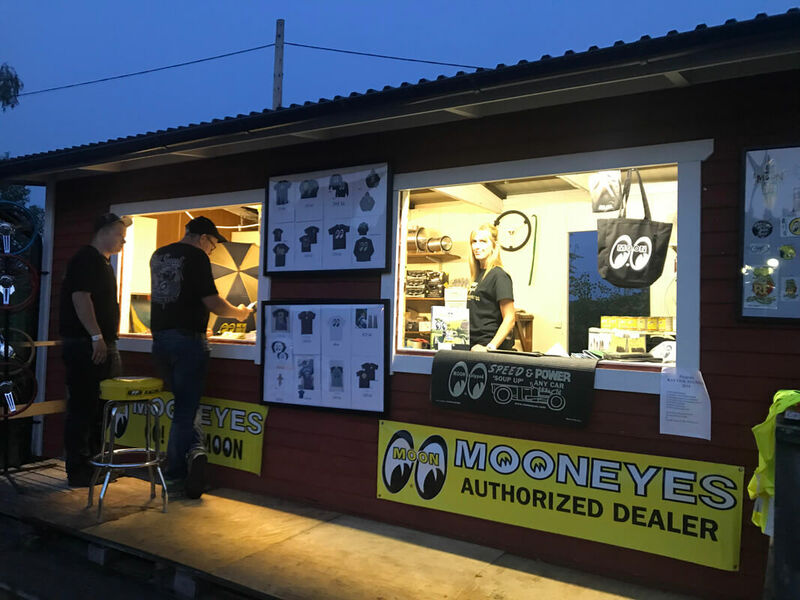 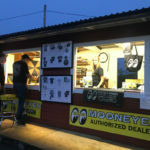 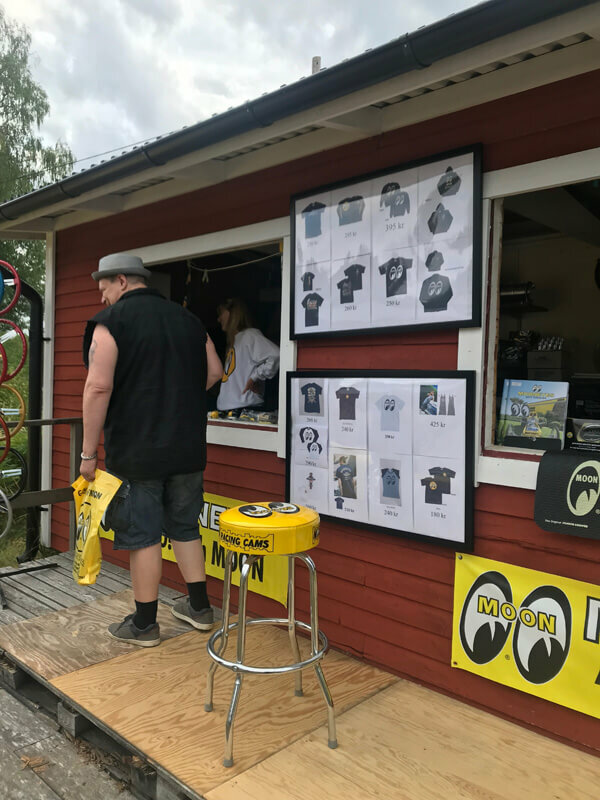 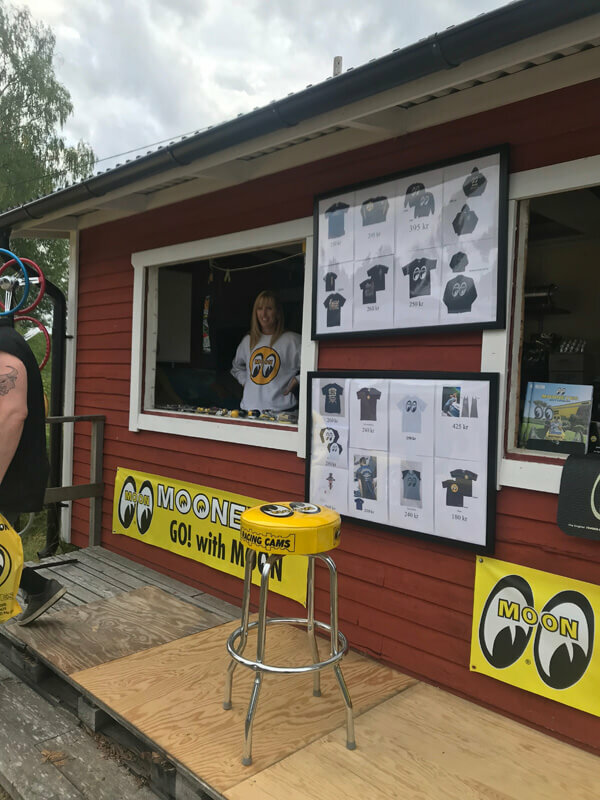 We again opened the Mooneyes merchandise booth for a few hours as the party goers showed up for the dance party. 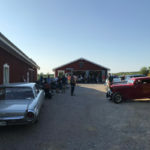 We closed shop about 10pm and joined the party in the barn, bands finished at 1am. 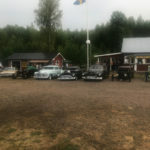 Was a long day but a great day, met a lot of cool people and everybody was kind to us, Thank You Sweden! 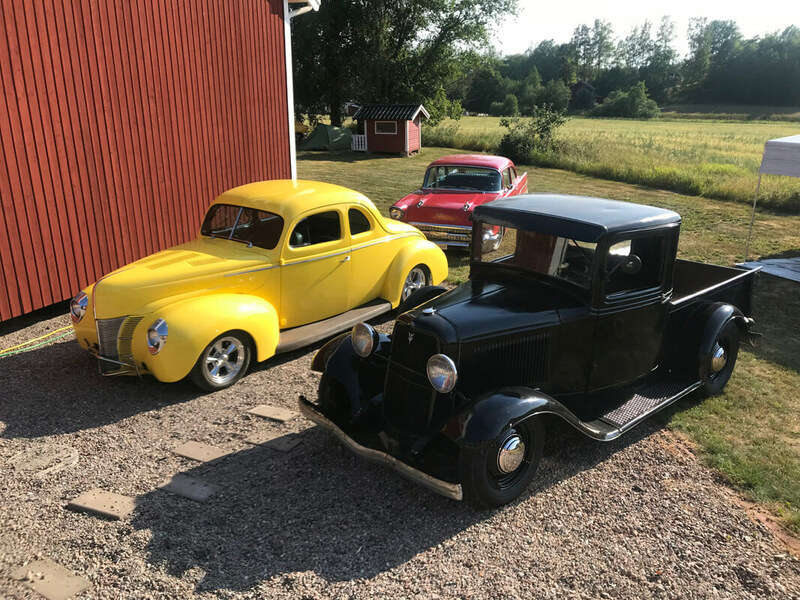 Sunday was the day to go do some sightseeing. 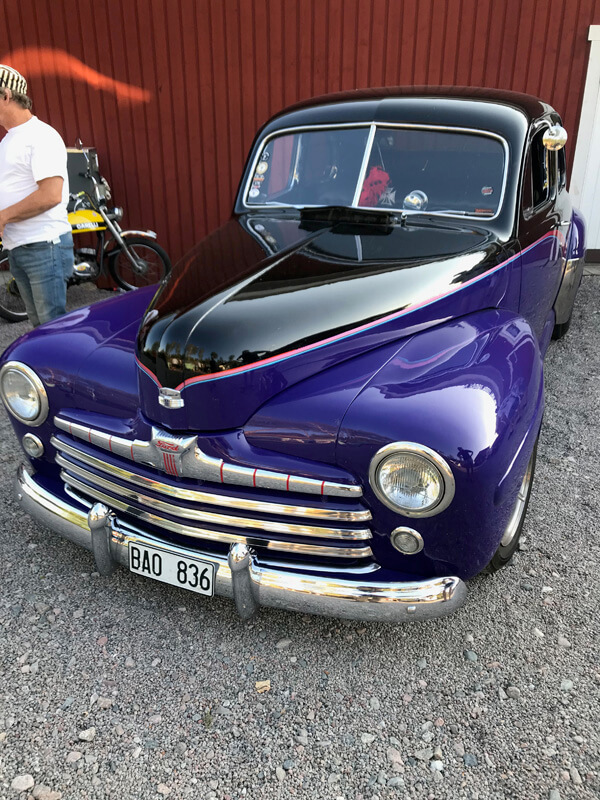 Hank took us into Stockholm and showed us around, what a beautiful city. 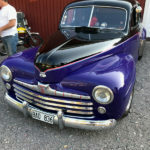 Went to the museum of the Vasa wooden sailing ship, very interesting and a must see if you ever get to Stockholm. 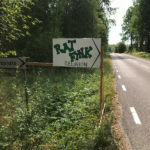 Walked the streets, had lunch by the water, shopped and went to the Castle and Church of the Royals. 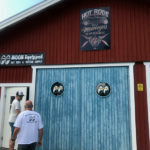 We really enjoyed this trip and many thanks to Hakan and Alke for there hospitality.